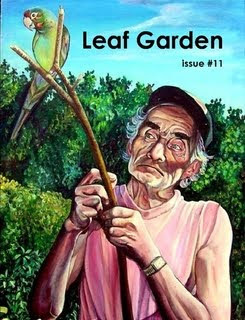 The eleventh issue of Leaf Garden is now available. Dom Gabrielli, Bill James, William Crawford, Gillian Prew, Elizabeth Eve (E.E. King), Judith Pfeifer, Justis Mills, Sean Pravica, Roger G. Singer, Kay Middleton, Gary Pierluigi, Michelle Lin, Jean McLeod, Mangesh Kaik, Jody Hesler, Brandon Bell, Jim Davis, Scott Owens, Dan Allawat, Duane Locke, Tamathy Christensen, Karen Grosman, Michael Keenan, Jake David, R.A. Fairchild, George McKim, Alex Franco, Matina L. Stamatakis, Thomas Beil, Dan Pitts, Rebecca Entel, Charles Bane, Jr.